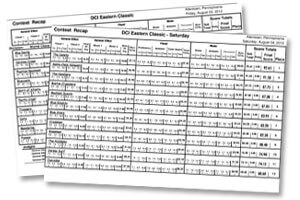 Since the Friday and Saturday DCI Eastern Classic events are considered to be one show in two parts with the same adjudication panel, the results from both days will be considered as being from one event. Two more corps broke 90 points at this show than at the DCI Southeastern Championship a week earlier, but only one more corps broke 80.0. One less corps broke 70.0 than had broken 70.0 in Atlanta. All but two of the top 14 corps from Atlanta remained in the same order as from a week ago, with the Cavaliers switching places with Boston Crusaders. Six corps added more than two points to their score and four corps scored lower than they did in Atlanta. The scores of the two Effect captions are counted for full value, but with two judges in each Visual and Music Effect, the score from each Effect judge is averaged together with the score from the second judge in that caption. The scores of the three Visual and three Music captions are divided in half before being added to the final score, since each of those six judges score on a scale up to 20.0 max. View the Friday, Aug. 3 DCI Eastern Classic scoring recap. View the Saturday, Aug. 4 DCI Eastern Classic scoring recap. Blue Devils (1st-95.10) remain undefeated by taking 1st in both Effect captions (Visual and Music) and all three Visual captions (Proficiency, Analysis and Color Guard). Most of the corps' advantage over Carolina Crown comes from the 1.00 lead in Total Visual. Brass and Music Analysis took 2nd to Crown and Percussion was 4th to Cadets. Still, the corps tied for 2nd in Total Music with Cadets, 0.35 under Crown. Carolina Crown (2nd-93.95) was 1st in Brass and Music Analysis, and despite being 3rd in Percussion, 0.40 under Cadets, still won Total Music. Music Effect took 2nd and Visual Effect 3rd, with Total Effect 0.50 under Blue Devils. Visual Analysis was 2nd and Visual Effect and Color Guard 3rd, but the corps took 2nd over Phantom Regiment by 0.10. The Cadets (3rd-92.65) added 2.05 in one week and won Percussion, just as in Atlanta last weekend. Visual Proficiency, Music Effect, Visual Analysis and Brass placed 3rd. Music Analysis was 4th, but 5th in Visual Effect dragged the corps down to 4th in Total Effect, and 6th in Color Guard pulled the Total Visual score down to 4th. Phantom Regiment (4th-92.25) captured 2nd in Visual Effect and Color Guard, over Crown and was under BD in both those captions. Music Analysis was 3rd. Music Effect, Visual Analysis and Brass all took 4th. Visual Proficiency was 5th and Percussion fell to 8th, a full 2.40 under Cadets' line. Considering that Percussion accounted for 1.20 of the total difference between the corps and The Cadets, and Cadets were only 0.40 ahead, it's easy to see the effect the caption has on the corps' final placement. Santa Clara Vanguard (5th-91.50) gained 2.65 from Atlanta, the most of any corps. SCV was all over the map in the Music captions; 2nd in Percussion, (only 0.20 down to Cadets), 6th in Analysis and 8th in Brass, (1.50 down to Crown); averaging out to 4th in Total Music. Visual Effect and Visual Proficiency was 4th and Music Effect, Visual Analysis and Color Guard ended in 5th. Bluecoats (6th-90.30) took 4th in Color Guard, 5th in all three Music captions, 6th in both Effect captions and Visual Proficiency and 7th in Visual Analysis. The Cavaliers (7th-87.75) passed up Boston Crusaders by 0.45 mostly due to a 1.20 spread in Percussion, which accounted for 0.60 of the surplus, 0.15 more than the total spread. Still, Percussion finished in 6th, as did Brass. Music Effect, Color Guard and Music Analysis was 7th, Visual Proficiency and Analysis 9th and Visual Effect 10th, leaving Total Effect in 9th. Boston Crusaders (8th-87.30) was 6th in Visual Analysis, 7th in Visual Proficiency and Brass, 8th in Visual Effect and Color Guard, and 9th in Music Effect, Music Analysis and Percussion, the latter caption being the major reason the corps slipped behind the Cavaliers since Atlanta. Madison Scouts (9th-87.05) gained 2.15 since Atlanta and was 7th in Visual Effect, 8th in Music Effect, Visual Proficiency and both Visual and Music Analysis, 9th in Brass, 10th in Percussion and 12th in Color Guard, which continues to be the corps' lowest placement. Spirit of Atlanta (10th-84.20) placed highest in Percussion, which took 7th. Color Guard was 9th, Visual Proficiency, Brass and Music Analysis finished 10th and all other captions ended in 11th, with Visual Analysis tying with Crossmen. Blue Knights (11th-83.95) added 2.15 to its score from Atlanta and was 9th in Visual Effect, 10th in Visual Analysis and Color Guard, 11th in Visual Proficiency and Music Analysis and 12th in Music Effect, Brass and Percussion. Blue Stars (12th-83.20) were 10th in Music Effect, 11th in Brass and Percussion, and 12th in Visual Effect and Visual Analysis. Visual Proficiency, Color Guard and Music Analysis finished out of the top-12 in 13th. Crossmen (13th-82.30) added 2.10 to its score in Atlanta and placed in the top 12 in four captions, up from two last weekend. Visual Analysis and Color Guard took 11th, the former tying with Spirit of Atlanta. Visual Proficiency and Music Analysis placed 12th. Both Effect captions and Brass finished 13th and Percussion 14th. Glassmen (14th-80.40) had no top-12 finishes. Percussion was 13th, Visual Proficiency and Analysis took 15th and the five other captions 14th. Pacific Crest (15th-76.65) moved up two placements despite scoring only 0.40 higher than in Atlanta. The corps' caption placements were spread across six positions; Visual Analysis in 14th, Color Guard 15th, Visual Effect and Music Analysis 16th, Visual Proficiency and Brass 17th, Percussion 18th and Music Effect 19th. Troopers (16th-76.65) moved up two spots from Atlanta. Music Analysis and Percussion finished 15th, Music Effect and Brass 16th, Visual Effect 17th and all three Visual captions 19th, though Total Visual finished 18th. Colts (17th-75.30) dropped 1.45 and one position from Atlanta. Visual Proficiency was 16th, Visual Analysis, Color Guard and Percussion 17th and the remaining four captions ended in 18th. The Academy (18th-74.90) fell three positions from Atlanta and lost 3.15 points, partly due to a 2.00 penalty for going overtime. Both Effect captions and Brass placed 15th, Visual Proficiency and Analysis and Percussion finished 16th, Music Analysis 17th and Color Guard 18th. Jersey Surf (19th-74.15) gained 2.30 from Atlanta and was 16th in Color Guard, 17th in Music Effect, 18th in Visual Proficiency and Analysis, 19th in Visual Effect, Brass and Percussion and 20th in Music Analysis. Mandarins (20th-69.95) lost 1.80 in one week and opened the gap between them and Surf from 0.10 to 4.20. Music Analysis was 19th and all other captions finished in 20th, with Visual Analysis tying for 20th with Cascades. Cascades (21st-68.60) lost 0.95 over the past week and placed in 21st, except for that tie for 20th in Visual Analysis. Pioneer (22nd-65.45) dropped 0.85 since Atlanta was placed 22nd in all captions.